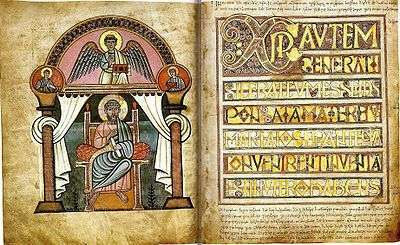 Manuscripts from the Winchester School or style only survive from about the 930s onwards; this coincided with a wave of revival and reform within English monasticism, encouraged by King Æthelstan (r. 924/5-939) and his successors. Æthelstan promoted Dunstan (909–988), a practising illuminator, eventually to Archbishop of Canterbury, and also Æthelwold and the French-trained Norseman Oswald. 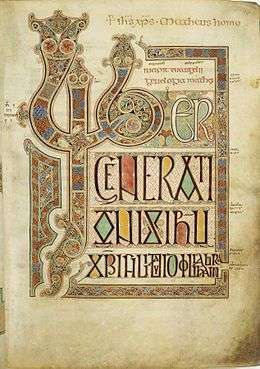 Illumination in a new style appears in a manuscript of the biographies by Bede of St Cuthbert given by Æthelstan to the monastery in Chester-le-Street about 937. There is a dedication portrait of the king presenting his book to the saint, the two of them standing outside a large church. This is the first real portrait of an English king, and heavily influenced by Carolingian style, with an elegant inhabited acanthus border. However the initials in the text combine Carolingian elements with animal forms in inventive fashion. 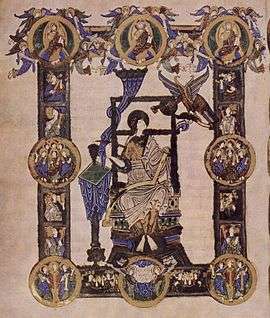 Miniatures added in England to the continental Aethelstan Psalter begin to show Anglo-Saxon liveliness in figure drawing in compositions derived from Carolingian and Byzantine models, and over the following decades the distinctive Winchester style with agitated draperies and elaborate acanthus borders develops. Pagan Anglo-Saxon metalwork initially uses the Germanic Animal Style I and II decoration that would be expected from recent immigrants, but gradually develops a distinctive Anglo-Saxon character, as in the Quoit Brooch Style of the 5th century. 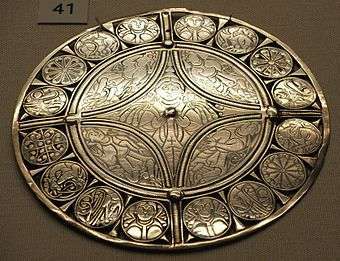 Round disk brooches were preferred for the grandest pieces, over continental styles of fibulae and Romano-British penannular brooches, a consistent Anglo-Saxon taste throughout the period; the Harford Farm Brooch is a 7th-century example. Decoration included cloisonné ("cellwork"), in gold and garnet for high-status pieces. Despite a considerable number of other finds, the discovery of the ship-burial at Sutton Hoo, probably interred in the 620s, transformed the history of Anglo-Saxon art, showing a level of sophistication and quality that was wholly unexpected at this date. 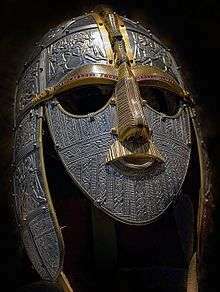 The most famous finds are the helmet and matching suite of purse lid, belt and other fittings of the king buried there, which made clear the source in Anglo-Saxon art, previously much disputed, of many elements of the style of Insular manuscripts. By the 10th century Anglo-Saxon metalwork had a famous reputation as far afield as Italy, where English goldsmiths worked on plate for the altar of St Peter's itself, but hardly any pieces have survived the depredations of the Norman Conquest in 1066, and the English Reformation, and none of the large-scale ones, shrines, doors and statues, that we know existed, and of which a few contemporary continental examples have survived. The references to specific works by the 11th century monastic artist Spearhafoc, none of which have identifiably survived, are about works in precious metal, and he is one of a small number of metalwork artists from the period whose name we know and whose work is described in any way. According to several sources, including the Norman chronicler Goscelin, who knew him personally, Spearhafoc "was outstanding in painting, gold-engraving and goldsmithery", the painting very likely mainly in illuminated manuscripts. It was probably his artistic work which brought into contact with the royal family, and launched his rapid promotion in the church. 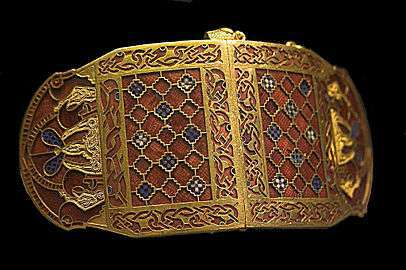 Even the imprecise details given, mostly by Goscelin, are therefore valuable evidence of what Anglo-Saxon metalwork was like. 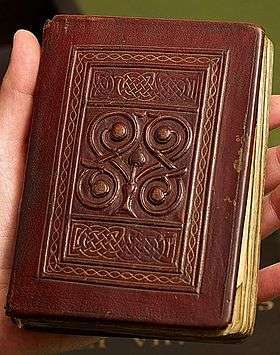 Anglo-Saxon skill in gold-engraving, designs and figures engraved on gold objects, is mentioned by many foreign sources, and the few remaining engraved figures closely parallel the far more numerous pen-drawn figures in manuscripts, also an Anglo-Saxon speciality. 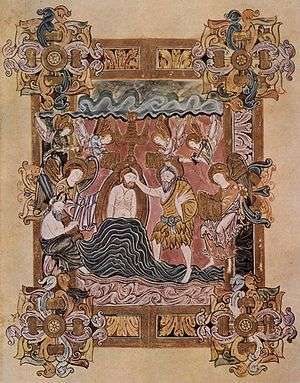 Wall-paintings, which seem to have sometimes contained gold, were also apparently often made by manuscript illuminators, and Goscelin's description of his talents therefore suggests an artist skilled in all the main Anglo-Saxon media for figurative art – of which being a goldsmith was then regarded as the most prestigious branch. One 11th century lay goldsmith was even a thegn. In the final century of the period a number of large figures in precious metal are recorded; presumably these were made of thin sheets over a wooden core like the Golden Madonna of Essen, the largest example of this type of Early Medieval figure to survive from anywhere in Europe. These appear to have been life-size, or nearly so, and were mostly crucifixes, sometimes with figures of Mary and John the Evangelist on either side. Patronage by the great figures of the land, and the largest monasteries, became extravagant in this period, and the greatest late Anglo-Saxon churches must have presented a dazzling spectacle, somewhat in the style of Eastern Orthodox churches. Anglo-Saxon taste revelled in expensive materials and the effects of light on precious metals, which were also embroidered into fabrics and used on wall-paintings. 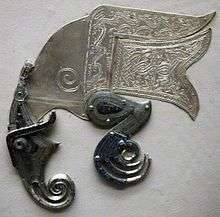 Sections of decorated elements from some large looted works such as reliquaries were sawn up by Viking raiders and taken home to their wives to wear as jewellery, and a number of these survive in Scandinavian museums. While larger works are all lost, several small objects and fragments have survived, nearly all having been buried; in recent decades professional archaeology as well as metal-detecting and deep ploughing have greatly increased the number of objects known. Among the few unburied exceptions are the secular Fuller Brooch, and two works made in Anglo-Saxon style carried to Austria by the Anglo-Saxon mission, the Tassilo Chalice (late 8th century) and the Rupertus Cross. 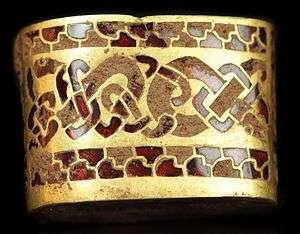 Especially in the 9th century, Anglo-Saxon styles, sometimes derived from manuscripts rather than metal examples, are found in a great number of smaller pieces of jewellery and other small fittings from across northern Europe. From England itself, the Alfred Jewel, with an enamel face, is the best known of a group of finely worked liturgical jewels, and there are a number of high quality disk brooches. The most ornate of earlier ones are colourful and complicated with inlays and filigrees, but the 9th century Pentney Hoard, discovered in 1978, contained six splendid brooches in flat silver openwork in the "Trewhiddle style". In these small but fully formed animals, of no recognisable species, contort themselves in foliage and tendrils that interlace, but without the emphatic geometry of the earlier "ribbon" style. 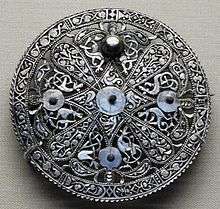 Ædwen's brooch, an 11th-century Anglo-Scandinavian silver disk brooch, shows influence from Viking art, and a fall-off from the highest earlier standards of workmanship. In 2009 the Staffordshire hoard, a major hoard of over 1,500 fragments of 7th and ?8th century metalwork pieces, mostly gold and military in nature, many with gold and garnet cloisonné inlays of high quality, was found by a metal-detectorist in Staffordshire, then in Mercia. 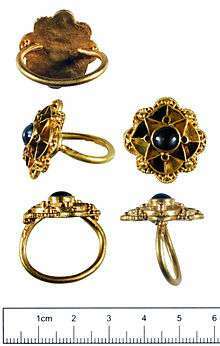 Jewellery is far more often found from burials of the early pagan period, as Christianity discouraged grave-goods, even including the personal possessions of the deceased. Early Anglo-Saxon jewellery includes various types of fibulae that are close to their Continental Germanic equivalents, but until Sutton Hoo rarely of outstanding quality, which is why that find transformed thinking about early Anglo-Saxon art. 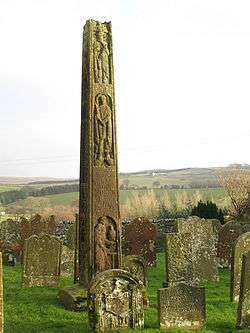 The Anglo-Saxon crosses have survived less well than those in Ireland, being more subject to iconoclasm after the English Reformation. Some featured large figurative sculpture of considerable quality, as on the Ruthwell Cross and Bewcastle Cross (both probably around 800). 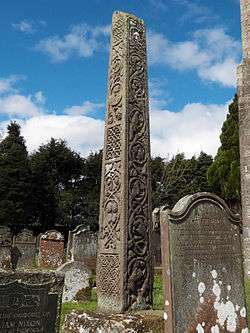 Vine-scroll decoration and interlace are seen in alternating panels on the early Northumbrian Ruthwell, Bewcastle and Easby Crosses, though the vine-scroll is already more prominent, and has faces to itself. Later Southumbrian crosses often only use vine-scrolls. There may be inscriptions, in the runic or Roman scripts, and Latin or Old English, most famously at Ruthwell, where some of the poem the Dream of the Rood is inscribed together with Latin texts; more often donors are commemorated. It has also been suggested that as well as paint, they may have been embellished with metalwork and gems. 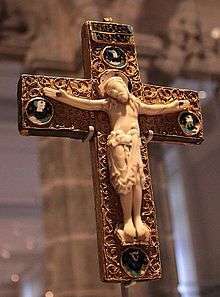 Typically, Anglo-Saxon crosses are tall and slender compared to Irish examples, many with a nearly square section, and more space given to ornament than figures. However, there are exceptions, like the massive Sandbach Crosses from Mercia, with oblong sections mostly covered by figures on the wider faces, like some Irish crosses. 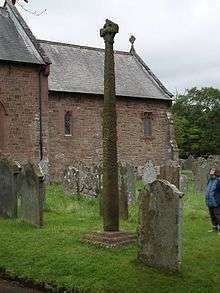 The Gosforth Cross, of 930–950, is a rare example to survive complete; most survivals are only a section of the shaft, and iconoclasts were more concerned to destroy imagery than ornament. Many crosses must have just fallen over after some centuries; headpieces are the least common survivals, and the Easby Cross was repaired with lead in a way described in early documents. Like many monuments from the area of the Danelaw, the Gosforth Cross combines Christian images with those from pagan mythology; apart from a Crucifixion scene, and perhaps scenes of the Last Judgement, all the other images appear to belong to the Norse myth of Ragnarök, the destruction of the gods, a theme detected in other Christian monuments in Britain and Scandinavia, and which could be turned to Christian advantage. The textile arts of embroidery and "tapestry", Opus anglicanum, were apparently those for which Anglo-Saxon England was famous throughout Europe by the end of the period, but there are only a handful of survivals, probably partly because of the Anglo-Saxon love of using threads in precious metal, making the work valuable for scrap. 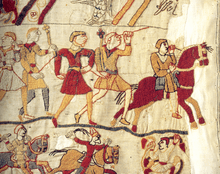 The Bayeux Tapestry is embroidered in wool on linen and shows the story of the Norman conquest of England; it is surely the best known Anglo-Saxon work of art, and though made after the Conquest was both made in England and firmly in an Anglo-Saxon tradition, points now accepted by French art-historians. Such tapestries adorned both churches and wealthy houses in England, though at 0.5 by 68.38 metres (1.6 by 224.3 ft, and apparently incomplete) the Bayeux Tapestry must be exceptionally large. Only the figures and decoration are embroidered, on a background left plain, which shows the subject very clearly and was necessary to cover very large areas. All kinds of textile arts were produced by women, both nuns and laywomen, but many were probably designed by artists in other media. Byzantine silks were available, though certainly expensive, in Anglo-Saxon England, and a number of pieces have been found used in burials and reliquaries. Probably, as in later vestments, these were often married with locally embroidered borders and panels. If we had more Anglo-Saxon survivals, Byzantine influences would no doubt be apparent. The most highly valued embroideries were very different, fully worked in silk and gold of silver thread, and sometimes with gems of various sorts sewn in. These were used for vestments, altar-cloths and other church uses, and similar roles in the homes of the elite. 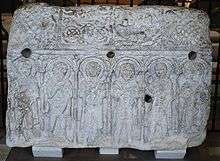 Only a few pieces have survived, including three pieces at Durham that had been placed in the coffin of St Cuthbert, probably in the 930s, after being given by King Athelstan; they were however made in Winchester between 909 and 916. These are works "of breathtaking brilliance and quality", according to Wilson, including figures of saints, and important early examples of the Winchester style, though the origin of their style is a puzzle; they are closest to the wall-painting fragment from Winchester mentioned above, and an early example of acanthus decoration. The earliest group of survivals, now re-arranged and with the precious metal thread mostly picked out, are bands or borders from vestments, incorporating pearls and glass beads, with various types of scroll and animal decoration. These are probably 9th century and now in a church in Maaseik in Belgium. A further style of textile is a vestment illustrated in a miniature portrait of Saint Aethelwold in his Benedictional (see above), which shows the edge of what appears to be a huge acanthus "flower" (a term used in several documentary records) covering the wearer's back and shoulders. Other written sources mention other large-scale compositions. 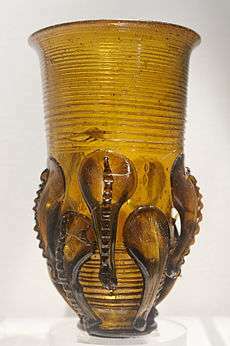 Anglo-Saxon glass was mostly made in simple forms, with vessels always in a single colour, either clear, green or brown, but a number of fancy claw beakers decorated with large "claw" forms have survived, mostly broken; these forms are also found in northern continental Europe. Beads, common in early female burials, and some ecclesiastical window glass was more brightly coloured, and several monastic sites have evidence of glass production. Vessel and bead production probably continued, at a much lower level, from the Romano-British industry, but Bede records that Benedict Biscop brought glass-makers from Gaul for window glass at his monasteries. It is not clear how much Anglo-Saxon glass was imported, but canes of millefiori coloured glass almost certainly were; one of these was in the purse at Sutton Hoo. Otherwise recycling of Roman glass may have avoided the need to import raw glass; evidence for the production of this is slender. Glass is sometimes used as a substitute for garnet in jewellery, as in some pieces from Sutton Hoo. Enamel was used, most famously in the Alfred Jewel, where the image sits under carved rock crystal, both materials are extremely rare in surviving Anglo-Saxon work. Wikimedia Commons has media related to Anglo-Saxon art. ↑ Seen by Wilson, 64–67, as "degeneration", this might also be seen as a return to the habits of La Tène style. ↑ Wilson, 135 for St Peter's; Dodwell (1982) as next ref. for the reputation. ↑ Dodwell (1982):46 and 55, who quotes Goscelin, and Historia:ciii-cv for the other sources. ↑ No unmixed examples, that is to say. 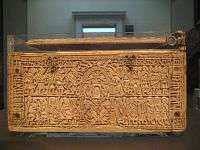 Scenes from Germanic mythology still appear in works of the Christian period, as in the Franks Casket and Gosforth Cross. ↑ Wilson, 154–156, quote 155; Dodwell (1993), 26; Golden Age, 19, 44, though neither these nor any textiles could be lent for the exhibition. ↑ Wilson, 108; Dodwell (1993), 27, who gives details of further fragments. ↑ Respectively numbers: Golden Age: 114, 140, 132, 117, and Zarnecki: 190, 97, 185, 180. There are many other examples. Bailey, Richard N. (2002). 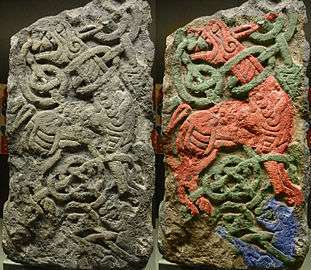 "Scandinavian Myth on Viking-period Stone Sculpture in England". In Barnes, Geraldine; Ross, Margaret Clunies. Old Norse Myths, Literature, and Society (PDF). Sydney: University of Sydney. pp. 15–23. ISBN 1-86487-316-7.